Chelsea Cut Manchester United’s lead to three points by beating Spurs as United slipped up at Portsmouth. 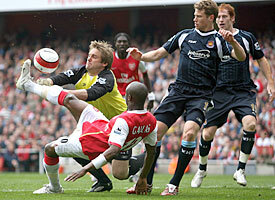 Robert Green The West Ham keeper almost single-handedly secured victory over Arsenal. Dagenham & Redbridge The Daggers secured promotion to the Football League with a win at Aldershot. Paul Jewell The Wigan boss is looking more bald, pale and tired than ever before as his side were dragged into relegation trouble after losing at home to Bolton. Arsenal The Gunners’ season continues to get worse with their Champions League place now under threat. Sheffield United Slipped into the relegation zone with defeat at Newcastle.